Enjoy all-in-one appeal with this design, letting you prep, slice, and wash on one simple surface. Say goodbye to slippery fruits and veggies with this smart cutting board, which lets you slide goods right into its silicone strainer without losing them down the drain. Simply chop and prop the the bamboo board under the faucet for easy rinsing. 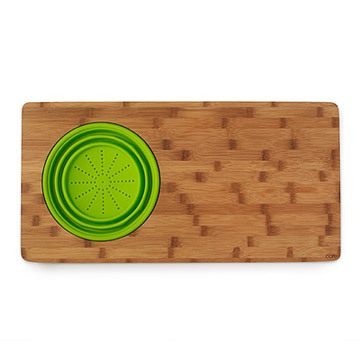 This bamboo cutting board features grips that hold the board tightly to the counter to prevent precarious flights of food. Made in China. Hand wash with soapy water. It "wood" be a great product if it was of better quality. Was a little warped out of the box and the wood split despite using the oil for the cutting board only after a few months of light use and the basket tore where the basket folds back into itself on the crease. Chopping board still in the wrapper, but laminated top and bottom layers of wood are warped at the edge of one side are clearly visible. This board cannot be used as a gift as planned due to poor construction. Reviewing return policy due to dissatisfaction. The size is awesome and def fits over my Mom's sink so she can cut and do whatever is needed, rinse and easily tip the board to drop the chopped ends into the garbage disposal. The only "concern" that I would have is the small compression on the top in one corner. It broke some of the fibers apart. It is not in the main cutting surface. Excellent product for expanding kitchen counter space in small kitchens! Quality board, affordable price, big enough to prepare a proper meal. 5 stars easy. Just wish the drain was a little bit smaller and the board a little bit wider to take up the whole sink space, but it will fit flush over most sinks as is without getting in the way. Very nice product design. It was a lot larger than I thought it would be, but that was great because then it can go over a larger sink. My friend whom I bought it for loved it! Sturdy and great quality. I bought two of these last Christmas for my sons. They liked them so well I bought a third for myself. This year my stepdaughter is setting up her own place and I knew I must get one for her as well! My only complaint is that when I dropped my own a few months back, a strip of the bamboo split off of the top. The board is still useable, just not quite as pretty.